I think Amit had intended it to be a working session. 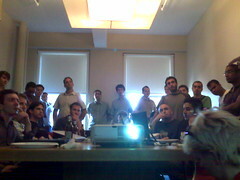 We hosted it at Union Square Ventures last night and the turnout was great. But it sort of turned into a Meetup more than a hackathon. My favorite part of the night was the facebook app demo session and in particular the Q&A that followed. We got to discuss and debate and learn about a lot of issues that facebook developers are coming up against. There were several very experienced (that’s relative, the whole thing is brand new) developers who freely shared their experiences with everyone else. Thanks to Amit for arranging the meetup/hackathon and I hope that Union Square Ventures will do more of these developer meetups/hackathons going forward. It was great fun. More photos on Flickr and Andrew has a much better post about the evening up on his blog including links to some of the apps we saw demo’d.